Dr. Elena Sharkova, Artistic Director of the Symphony Silicon Valley Chorale, joined the Music Department at San José State University in the fall of 1998, where she served as assistant professor of music and Director of Choral Activities until June 2006. There, along with leading the Chorale, she directed two of the University choral ensembles – the University Women’s Chorus and the Concert Choir — and taught classes in voice, ear-training, choral methods, and choral conducting. Three years ago she was named Artistic Director of the Cantabile Youth Choruses, a program of the Cantabile Choral Guild. In addition to her Silicon Valley positions, Dr. Sharkova is currently appearing as guest conductor with choruses throughout the United States. Dr. Sharkova was born and raised in St. Petersburg, Russia, where she received a Bachelor’s Degree in music education and piano, and a Master’s Degree in choral conducting from St. Petersburg State Rimski-Korsakov Conservatory. Upon graduation in 1988, Dr. Sharkova was appointed Chair of the Choral Department of the Preparatory Music School at the Conservatory where she conducted four children’s choruses and taught the innovative Ogorodnov Method to graduate students until 1993. 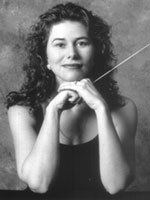 In 1996 Dr. Sharkova received her second Master’s degree in choral conducting from Western Michigan University. Before moving to the U.S in 1993, she toured extensively for five years with one of the finest Russian professional choirs, Lege Artis. Besides concertizing throughout Russia, Europe and the United States, the ensemble also recorded five CDs for the SONY Classical label and won numerous prizes at European choral festivals and competitions. Dr. Sharkova is in demand as guest conductor, clinician and adjudicator, and has lectured extensively on Russian choral tradition and performance practices. In addition, she has presented workshops and clinics for ACDA, CMEA and Association of Kodaly Educators on innovative choral rehearsal techniques. Choirs under Dr. Sharkova’s direction toured and performed in Scandinavia, the Baltic Republics, Russia and Austria. Dr. Sharkova has previously held faculty positions at Western Michigan University and St. Petersburg State Conservatory.